Cubism as an art movement became popular in 20th Century. It began in the art world with artists such as Pablo Picasso, through his abstract paintings and sketches. He reduced complex images to simple geometrical forms. This concept slowly spread to architecture and product design. 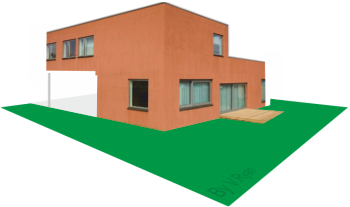 Buildings based on cubist design principles are usually simple geometrical forms. An attempt has been made by the architect, to move away from traditional building shapes and forms. Doors and windows are in line and a simple colour scheme is applied. Modern building materials are used for the construction. Often, the interior of cubist buildings is divided up into square / rectangular spaces. 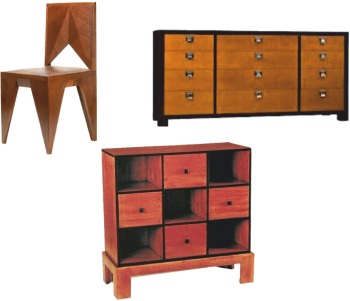 The furniture seen below, are all based on simple geometrical forms. The shape of a cube is the starting point for the designer. 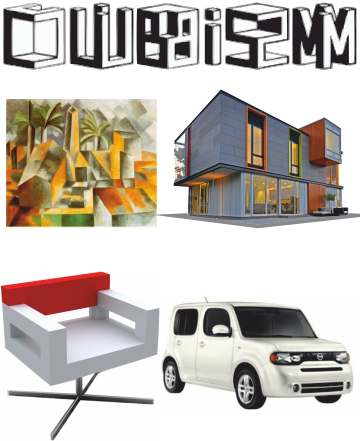 For this reason, cubist furniture is easy to identify.